This post is part of the Sparkle Quilt Along. For more information see here. Sparkle Quilt Along, a photo by jenib320 on Flickr. 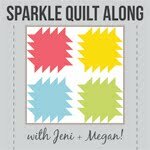 Welcome to the fifth week of the Sparkle Quilt Along, hosted by Megan of Canoe Ridge Creations and myself! Today I'm going to walk you through how to put your quilt top together! Before we start sewing, make sure your blocks and sashing strips are well pressed. If you haven't cut your sashing yet, refer back to the cutting instructions here. If you're sewing the lap size, you'll need to join two strips together and trim to the correct length for sashing in steps 2 and 3! 1. Lay out your blocks, placing a 2"x12.5" sashing strip between each block. Sew the blocks and sashing in each row together. I pressed my seams towards the sashing to reduce bulk, but feel free to press them however you'd like! 2. Once all your rows are sewn, we're going to sew the sashing that goes between each row as well as the top and bottom of your quilt. This will vary depending on what size quilt you're making! Sew together the same way we sewed the rows! Press seams. 3. Now we're going to sew the side sashing pieces on! Press. Voila! You're done! Give your finished top a good press and square up if necessary. It looks perfect Jeni!! I love the movement in the blocks! I love the fabrics you chose. So cute!